Vriesea ‘Splenriet’, a hybrid of Vriesea splendens that is also known as flaming sword, is ideal for novice gardeners. As a member of the bromeliad family, this plant is epiphytic in nature (meaning that it extracts nutrients from the air) and is super-easy to care for. Bromeliad blooms last for an average of 3-6 months, making them some of the longest-flowering plants. The flaming sword is unusual looking and quite distinct from typical office and indoor plants. The spikey foliage is unusually attractive, but it is the flat, colourful, sword-like blooms for which the plant is most highly prized. Water: Bromeliads are tropical plants with a ‘rosette cup’ at the base of the leaves that should always be full of water. Take care not to let the water stagnate – a weekly top-up allows the ‘old’ water to be displaced into the soil, which is exactly what the plant needs to thrive. 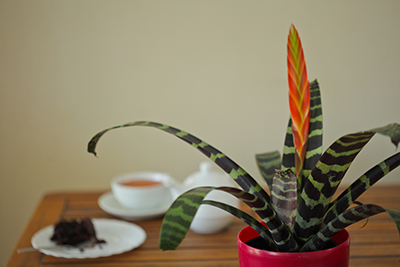 Pest control: Bromeliads require no pest or disease control. Feed with: A monthly addition of liquid fertiliser to the water will promote plant growth and intensify colours. The humidity level is too low. Misting will help rectify this. The centre cup of the plant is dry. Water more frequently. Brown leaf patches: The most likely cause is too much direct sunlight. Move the plant to a shadier position.